It would be stretching the truth to say that York Minster is on my doorstep, but it is nevertheless very doable, and I have been thinking of going to the Sankta Lucia festival for a few years. This year I had a firm intention and bagged my seat. What a treat! Sankta Lucia is celebrated on 13th December in memory of Saint Lucy who, legend has it, brought food and aid to those hiding in the catacombs during the Diocletianic persecution. She wore a candle-lit wreath on her head to light her way and to keep her hands free to carry food. 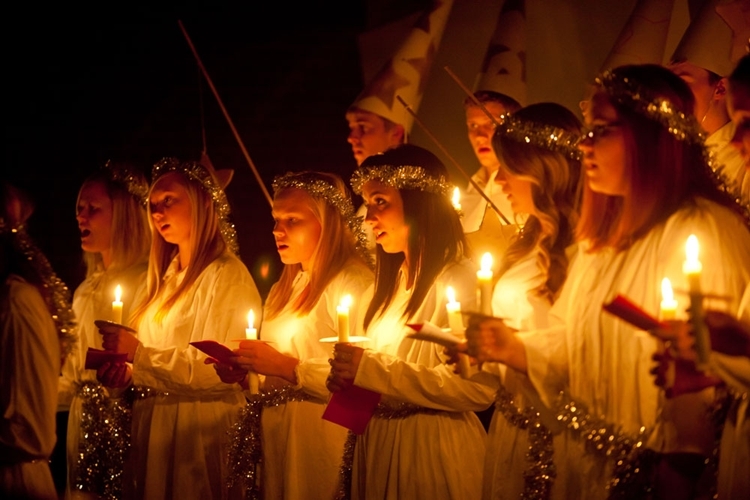 Celebrated mainly in Scandinavia where the winters can be long and dark, it has become known as the festival of light. It is tremendously uplifting and just the thing to get one in the spirit of the season and in the setting of York Minster, so very special. Needless to say I shall be going back next year and probably going more than once. They are busy bees at York Minster, there is a lot more going on than meeting for worship and architecture. Go do, be, experience!